It’s no secret; education and its funding have been the focus and all-consuming issue this session. It’s much more than just a legislative issue, it’s a personal one. The hundreds of Senate District 31 constituents who have visited my office over the last four weeks aren’t just constituents; these are the people we all do life with. People, who I go to church with, grew up with. They’re the ones who taught me in school. They are classmates, former students of mine and former colleagues. They are relationships I value. But in addition to education, our rural nursing homes and hospitals, our mental health system, our intellectually and developmentally disabled population, our roads and bridges also need attention and funding. Two things I’ve learned serving as your senator: you elected me to ensure all areas of state government are running efficiently (without waste) and to make sure all areas of state government are properly funded. In addition, we have cut 85% of the state’s agencies, 45% over the last decade. We’ve also reduced 7,000 state employees and consolidated or eliminated 18 agencies in that time. To put this into perspective, half a billion dollars (over $500 million) in new revenue was created for public education in an environment of tough political circumstances and a requirement of a three-fourths majority vote. What had not been accomplished in 30 years and what seemed to be impossible, was accomplished on March 26, 2018. This legislation provides the largest teacher pay raise in state history, moving Oklahoma to the second-highest in the region in average teacher pay. We also passed HB 3705, which appropriates $2.9 BILLION, or a 19.7 percent increase overall in education funding. 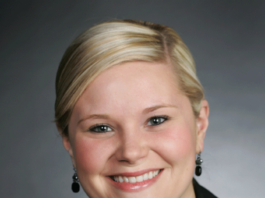 The bill includes a 22 percent increase overall to the State Aid Funding Formula, with $33 million line-itemed for textbooks and $17 million into the state aid formula. The revenue package also includes $63 million in tiered funding for state employee pay raises, and another $52 million for a $1,250 pay raise for education support staff. What was accomplished with the passage of the above mentioned legislation is historic. Difficult decisions were necessary, and while our work in education is not done, I am proud of the strides we have achieved thus far. OKLAHOMA CITY – Sen. Lonnie Paxton applauded Gov. Fallin for signing legislation Tuesday to help grow Oklahoma’s agriculture industry by allowing farmers to grow industrial hemp. House Bill 2913, by Sen. Paxton, Rep. Jon Echols and Rep. Mickey Dollens, creates the Oklahoma Industrial Hemp Agricultural Pilot Program. 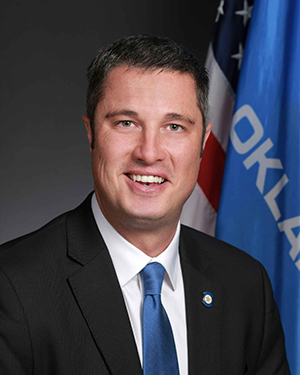 OKLAHOMA CITY – To strengthen Oklahoma families and the state’s economy, the Senate approved legislation Wednesday to establish work or training requirements to participate in the SoonerCare Medicaid program. House Bill 2932, authored by Sen. Adam Pugh and Rep. Glen Mulready, would instruct the Oklahoma Health Care Authority (OHCA) to seek waiver authority to modify Medicaid eligibility criteria to require documentation of the same education, skills, training, work or job activities currently required by the Supplemental Nutrition Assistance Program (SNAP). The bill would mirror federal Medicaid law and SNAP by exempting from the new eligibility requirements those individuals who are 19 years of age or younger or over 60 years old, pregnant, medically-certified as physically or mentally unfit for employment, or who are a parent or caretaker of a dependent child under a year old. 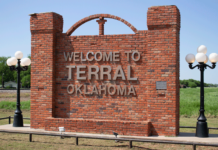 According to the OHCA, there are approximately 106,600 Oklahomans who are a part of the parent/caretaker group receiving Medicaid coverage who are able-bodied/working-aged adults 19 to 64 who are not pregnant, disabled or blind. Thirty-two percent of those recipients were male and 25 percent were two adults living in the same home and both receiving Medicaid coverage. An analysis by the agency of SoonerCare members covered in FY’17 found that around 8,000 out of those 106,600 would not have met any of the exemptions outlined in the bill. Currently, more than 600,000 Oklahomans receive SNAP benefits (formerly known as food stamps) each month. In FY’17, there were more than one million Oklahomans enrolled in SoonerCare Medicaid with nearly 796,000 SoonerCare recipients in March 2018. OHCA also noted there are nearly 81,000 SoonerCare recipients who also receive SNAP benefits. The coauthor of the measure, Sen. Paul Rosino has been a strong advocate for the federal government’s push to get states to create work requirements for eligible Medicaid recipients. The bill now returns to the House for final consideration. Besides being approved by the Governor, the new eligibility requirements would have to also be approved by the federal Centers for Medicare and Medicaid Services. 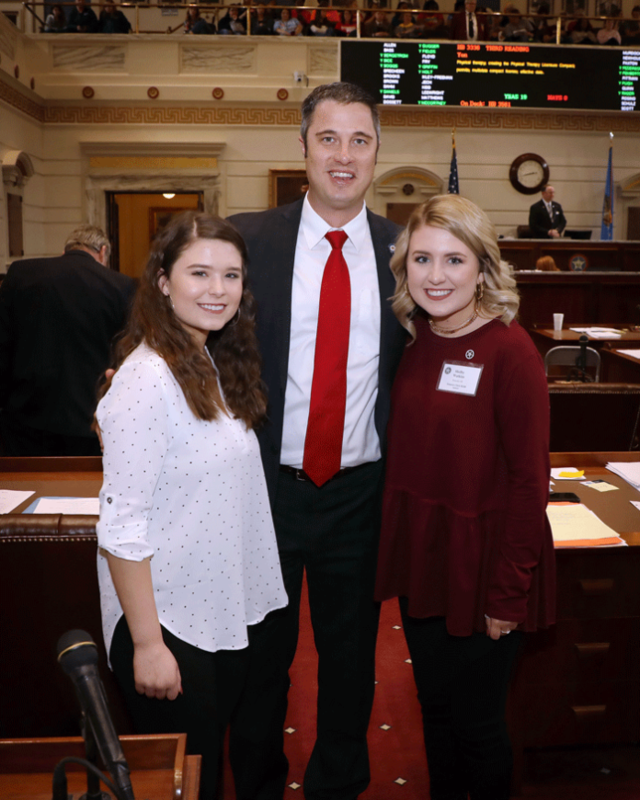 Comanche High School senior, Shelby Watkins, and sophomore, Ryleigh Watkins served as Senate pages for State Sen. Chris Kidd, R-Waurika, during the tenth week of the legislative session from April 9 – 12, 2018. Shelby and Ryleigh are the daughters of Waurika residents Chris and Raquel Watkins. “Today the Senate Democratic Caucus welcomed thousands of educators, parents, students, and concerned citizens to the Capitol. We stand with them in their fight to properly fund public education in Oklahoma. Paying our teachers a fair and competitive salary is a priority, but this movement is about more than just teacher pay, it’s about the chronic underfunding of public education in Oklahoma. Over the last decade state funding for public education is down $180 million, marking a 28% cut. Since the 2013-14 school year, student enrollment has grown by 15,000 students but there are 700 fewer teachers in our public schools, with 20% of public school districts in Oklahoma moving to four day school weeks. Our students deserve better. We need to restore funding for education which has been slashed by years of tax cuts. The legislature passed a revenue package last week, but more work needs to be done to provide sustainable revenues for education. Even though floor sessions and committee meetings were pretty light this week, negotiations continue on a teacher pay raise plan. Leaders in the House, Senate and governor’s office are hard at work trying to provide teachers with proper compensation while balancing the needs of all other core services of government. It’s not an easy feat, which is why you may have seen several possible plans floating around social media lately. If you have any thoughts on the pay raise proposals, please reach out and let me know. I’m at Marcus.McEntire@okhouse.gov or 405-557-7327. Thanks, and may God continue to bless our great state. We’re into the second half of the legislative session. Being that last week was the deadline for floor action on Senate bills, we were extremely busy. We heard more than 300 bills in the last two weeks. 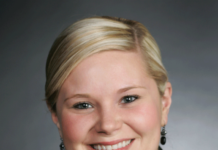 Senate Republicans voted strongly (85%) in favor of the revenue package presented Thursday night through HB 1033. We voted on HB 1033 that would generate $450 million for a 12.7 percent teacher pay raise and a $2,500 state employee raise. The measure would have increased the GPT from 2-4 percent on all wells ($126 million); increase the gas diesel tax by six cents ($170 million); and increase the cigarette tax by $1/ pack ($152 million). SB1033 failed by two votes, only two votes away from the constitutionally-required three-fourths majority. But we’re not done. We will keep working to find a solution to create revenue that our Democratic colleagues can agree with. While the bill to pay for the raise failed, the actual bill (SB133) creating the raise passed overwhelmingly so as soon as we find a revenue source, the vehicle is there ready to move forward. Unfortunately, revenue raising measures must get approved by 75 percent of both the Senate and House. In the Senate that is 36 votes and in the House, it’s 76 votes. The source of the gridlock in Oklahoma is that we require super majority approval for revenue raising measures. SQ 640, enacted by voters in 1992, has led to the current gridlock and made it virtually impossible to approve reasonable revenue plans to shore up the state budget and provide teacher and state employee pay raises. The Senate recently approved SJR61 which would send SQ640 back to the vote of the people for them to modify SQ 640 so that 75 percent support for tax increases is required except for increases to sales and use taxes, which would only require a 60% (3/5) support from the House and Senate. Also this week, I finished up my remaining bills that passed off the Senate floor. These included: SB1364, which modifies procedures for sale of certain property and SB1365 modifies the maximum amount of certain county retirement contributions. SB1369 is a bill that clarifies language relating to police and fire arbitration. SB1372 extends the billing cycle of the State Medicaid Program and, lastly, SB1488 creates a lifetime landowner license. If you are planning a visit to the Capitol in the coming weeks, please let me know. I’d love to talk to you. I’m atMarcus.McEntire@okhouse.gov and 405-557-7327. Thanks and God bless.